I just made a utility to create palette independent signon screens for the standard dos wolf. It was created by analyzing Bmp2C output (Chaos-Software) and checking VL_MemToScreen function in ID_VL.C. It also includes a "blank" template bmp, so you don't have to take screenshot of the original. Thanks, Code. I'll definitely be needing this for my own TC. The Munchkins palette isn't even *close* to Wolf3D's. No problem, let me know if you run into any problems. Some colors got corrupt and the template was a bit off, I fixed those issues. Also I created an icon for it. One more update, still some colors got corrupted with version 1.1, those issues are now a thing of the past. I updated the program to version 1.2 which takes care of color corruption once and for all. If you still run into problems, I added some error checks in the program that will help me track corrupt colors if they appear again. Hmm, I haven't seen that feature in Chaos-Edit. It does convert palette to C but I'm not sure if it converts signon screens, unless there's something I'm missing. This is a useful program. Would it be possible to get support for 640x400 signon screens? Thanks. It should be possible, I just need to see how Wolf4SDL handles those screens. Great, I should be able to test it for you. If you want to create output for Wolf4SDL, please include wl_def.h instead of version.h and use "byte" as the signon data type instead of "unsigned char" to make it compatible with MSVC++ 6. Note, that the signon.cpp contained in the Wolf4SDL source code contains two signon screens, which is not necessary at all for custom signon screens. @Greg: Did you just export the palette of the BMP to C with ChaosEdit or did you export the whole image to C to be used as a signon screen? I only know of the first option! If the second is also possible, where did Andi hide this feature? Ok, I will use byte. If it uses two signon screens doesn't that equal 640x400 resolution for single picture? How are they saved? Ripper means that WolfSDL's Signon has the Wolf3D sign-on screen as well as the Spear one in one file. Anyway, Signon.CPP is saved using BMP to C.
BTW, if you wanted to use more than one screen to put together a 640x400 sign-on screen, you'd either use two 640x200 screens, or four 320x200 screens. I just took a peek at the signon.cpp and it is stored in almost identical way. I'll change the variable type from "unsigned char" to "byte" to make it compatible with MSVC++ 6 like Ripper suggested and remove the array size because Wolf4SDL doesn't use it anymore. I have an older version of Wolf4SDL and my copy has only one signon screen but now that I know what it's for, I can leave it out. Okay I'm finished with the testbuild of WolfSignon 1.3 and I've sent it to Andy for testing. 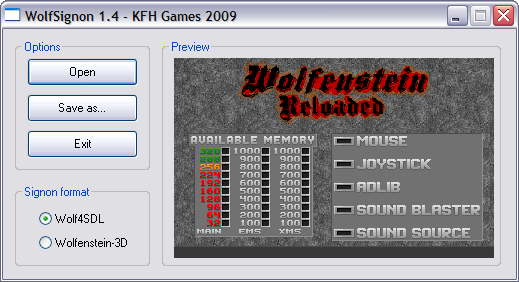 Andy finished testing WolfSignon 1.3 and it is now ready for download. Please review the included readme.txt, as the commands have changed a bit. Can you tell me the exact steps you took to convert the bitmap, I can't find this feature in my Chaos-Edit. I think I might have seen that feature in WDC though, but I'm not sure because I haven't used it very much. Anyhow... If I create a new palette for the game, I use Chaos-Edit to export the Palettes to a file in C++ format. Those I combine and edit using the same Ultra-Edit program and steps I list below for the signon BMP's. I really miss being part of this place daily and talking with my friends and helping out. Don't worry about such a small mistake, with such strong meds I'd propably be the same. Hope you get well soon. A new version of WolfSignon is soon out! Nothing has changed, except that it now boasts a Windows based user interface. Ok, it is now available for download! Click here to visit the news post! Thanks, I hope people find this update more convinient to use than the older version.